It was developed by Polartec LLC for the U.S. Special Operations Forces. Now declassified, a first-of-its kind insulating material will be used in jackets by outdoor brands beginning in 2013. Called Polartec Alpha, the new insulation was announced last week. It is made in an East Coast factory where Polartec has for decades pumped out its famous synthetic fleece. Like the brand’s Polarfleece fabric, the to-be-released Alpha insulation is a polyester-based material spun to specifications on machines in a Lawrence, Mass., mill. It will be on display at trade shows this winter for launch in outerwear lines later next year. Brands adopting Alpha insulation in jackets, according to Polartec, are numerous, including 66 North, Eddie Bauer, Eider, Mammut, Marmot, Montane, Mountain Equipment, Rab, Ternua, Terry Cycle, The North Face, Trangoworld, Vaude and Westcomb. Made for winter jackets of the “puffy” variety, Alpha’s main competition is goose down and PrimaLoft, the latter a synthetic down. Polartec cites Alpha as a different makeup from either, something more like an airy fleece, not a loose fill. Down feathers and most synthetic insulation can poke through permeable fabric. This means puffy jackets often use dense materials to encapsulate the insulation, creating jackets that may not let sweat and body-heat moisture easily escape. As noted, Polartec touts Alpha as enabling the industry’s first breathable puffy garments. The fleecy Alpha material is an insulating mass that traps body heat. But it is also stable enough to be stitched into jackets that use highly-breathable fabrics. Alpha, like PrimaLoft, offers insulating properties even if wet. 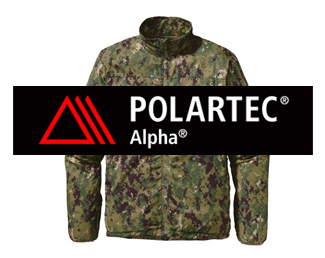 Polartec cites faster drying with Alpha if it does get soaked in the wilderness. It dries “60% faster than other synthetic insulations,” said a company spokesperson. Gear Junkie: What exactly is Alpha made of, and what does it feel like in the hand? Nate Simmons: It’s a spun poly-filament polyester knit construction. Just the insulation alone feels kind of like a very light, open-knit, high-loft fleece. In a finished garment it feels like a traditional puffy just more breathable [when wearing it]. In the press announcements, why all the emphasis on U.S. Special Operations Forces? This product was requested by the Special Forces and developed specifically for them. It is currently fielded with thousands of operators around the world and was one of the highest-rated clothing products they have ever tested. The versatility of the product and ability to insulate while wet and dry much faster than other products made this a standout product for them. It is now available commercially. You tout the possibility of a “breathable puffy” with Alpha. How can an outerwear brand use a more-breathable face fabric with Alpha as compared to what’s on the market now? It is more stable. Both down feathers and synthetic fibers can poke through the fabric [of a jacket] and therefore require a very dense, “down-proof” face fabric. Polartec Alpha is much more stable, more like a fabric itself, so it does not require such a dense-woven face fabric. How is this different from Power Shield High Loft Fleece, which is a similar insulation to Alpha that was introduced earlier this year by Polartec in jackets from The North Face and others? Polartec Power Shield High Loft, as seen in the TNF Polar Hoody jacket, is a high-loft fleece laminated to a woven face. It is very light and very warm. 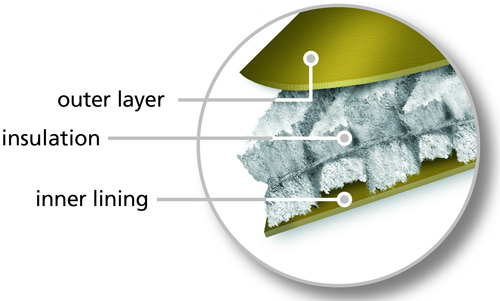 Polartec Alpha is the interior insulation only. Brands can then select the woven face and back. This provides a lot of flexibility to the clothing brands to design their garments — you will see versions with super light woven faces and even stretch woven softshell faces. We will also see a range of different interior surfaces [from partner brands]. How much does Alpha weigh compared to down or synthetics like PrimaLoft? We can produce multiple weights of Alpha and a range of warmth levels. But we have styles in the same weight ranges as popular synthetic insulation at 80 grams per square meter to 100 grams per square meter. Will Alpha cost about the same as comparable synthetic insulation? Polartec Alpha garments will probably be similar in price to other synthetic insulation types at retail. But this will largely depend upon the brands’ choices of face and back fabrics. One advantage is that Polartec Alpha does not require quilting so it provides design flexibility to the brands. Which brand will have the first jacket with Alpha, and when will it be to market? Is Alpha “warmer” than down or synthetic insulation, ounce for ounce? It is not warmer ounce for ounce than all synthetic insulation. It wasn’t designed to be warmer — it’s designed to be a more breathable, more active puffy insulation product. This is much like synthetic insulation isn’t as warm as down but has an important place in the market. This versatility enables Alpha to span a wider range of activities and weather conditions, and it also makes Alpha a functional mid-layer under a shell jacket, whereas other puffy-type jackets [used like this would be] vapor barriers.